Halloween has always been one of my favorite holidays. It’s sooo Edgar Allan Poe! 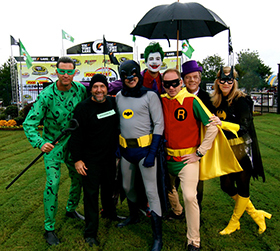 Some of my favorite Halloween moments have come in NASCAR….hosting national television shows in full costume for our NASCAR Camping World Truck Series broadcasts. Hard to pick a favorite, but I think I’m partial to the Wizard of Oz. This year, in addition to packing extra hand sanitizer for NASCAR’s trip to Dallas (yes, I AM that person…ask my co-workers! ), I find myself torn between choosing the Shark or Lion costume for my 14-month old daughter’s 2nd trick-or-treating excursion. 1. I am luckier than a lot of the men/women with whom I share the NASCAR garage each week. I am able to bring my daughter with me for several weekends throughout the year. The crew guys can’t do that. Trust me, it’s not cheap and it’s a logistical juggling act. But I can, and with my husband’s help, have made it happen. I do not take that luxury for granted! 2. My daughter is safe. When I am gone, she is with my husband. Or her grandparents. Or a fantastic sitter. She is safe and healthy and enjoying life. And THAT is what truly matters. 3. I love my job. I love telling stories. I am proud of the fact that I get to show her that you can have a family AND a career. At the same time. I hope I am a role model for her, and other little girls. Did I mention, I love my job? Yes, I have been known to hit mute on my weekly conference calls so I can change a diaper or dance to “I’m a Little Teapot” but I figure, if Michael Waltrip can criss-cross the country to broadcast a truck race, run Sprint Cup teams, and dance a Foxtrot…I can figure out how to research a story WHILE chasing a toddler out the door, diaper bag contents spilling out behind me. Hang tough, or rather Hang Ten, Moms!! Yep…I think we’re going to go with the Shark.